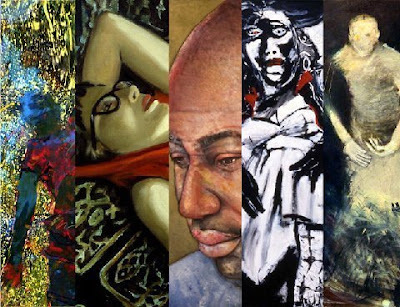 Tabla Rasa Gallery's newest installation will be The Portrait: Painted and Personal. This show will include works by one of Tabla Rasa's owners, Audrey Anastasi. I was lucky enough to be able to check out her studio when I first visited the gallery, and her work is absolutely gorgeous. It should be a fantastic show. It will run from March 4th through April 3rd; the opening reception will be Wednesday, March 4th from 6 PM to 8 PM. Tabla Rasa Gallery is delighted to host The Portrait: Painted and Personal curated by Robin Ross, and Giustina Surbone. This exhibition presents the viewer an opportunity to see beyond traditional portrait painting. Exhibiting artists include Nana Deleplanque, Robin Gaynes-Bachman, Audrey Anastasi, Robin Ross and Giustina Surbone. The Portrait: Painted and Personal, presents the genre of portrait painting with the works of five contemporary figurative painters: Audrey Anastasi, Robin Gaynes-Bachman, Nana Deleplanque, Robin Ross and Giustina Surbone. All combine realism, abstraction and form to create large-scale work. These five artists work in a personal manner without idealizing the subject. Using traditional rather than conceptual methods, they display mastery without arrogance. Because they are fueled by their experience, personal expression is a priority over faithfully reproducing the subject in their work. Perhaps, in spite of this, the artists capture the physicality and individuality of human identity, sometimes of themselves, sometimes of their subject, sometimes of the intersection of both artist and subject. From this perspective, The Portrait: Painted and Personal invites us to go beyond simply examining the beauty and detail of exquisite painting.